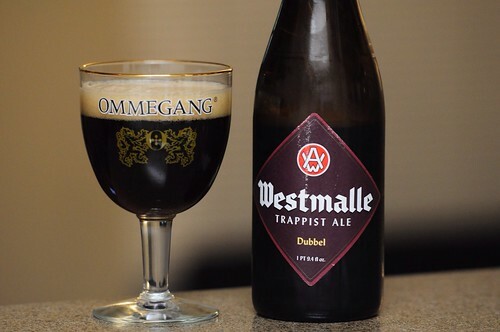 Westmalle Trappist Dubbel, originally uploaded by adambarhan. A: The pour is a dark amber color with a big tan colored head. S: The nose is good, but not over the top. Some dark fruits in the form of raisins, plums, and figs with plenty of sweet malt notes: molasses, caramel, and toffee. T: A lot more intensity in the flavor. A great malt character that’s bready with balanced sweetness that provides some molasses, toffee, caramel. The fruits are over-ripe and sweet, mostly cherries, plums, and figs. M: Medium in body with very ample to high carbonation. D: Really a delicious and easy to drink beer. One of the better dubbels I’ve had.